CARICOM Secretariat, Turkeyen, Greater Georgetown, Guyana - Heads of Government of the Caribbean Community (CARICOM) will engage business leaders as part of the overall effort to improve the economic situation of the Region. This was announced by Chair of the Conference of Heads of Government, Dr. the Hon Ralph Gonsalves as he wrapped up the 25th Intersessional Meeting Tuesday in St Vincent and the grenadines. “The Heads of Government have agreed to have a high level consultation with the captains of industry and commerce at our Regular Meeting in July,” the Prime Minister said. Briefing representatives of the media at the conclusion of the summit, Dr. Gonsalves, who is the Prime Minister of St. Vincent and the Grenadines where the meeting was held, said that of the items on the lengthy agenda, the centerpiece was the economic situation facing Member States and the fashioning of a framework for sustainable Regional growth and development. The Heads of Government received a report from the Commission on the Economy which was established in September. 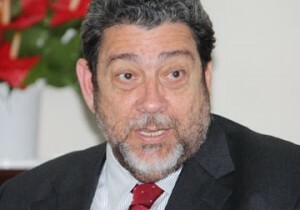 Prime Minister Gonsalves said the report was a work in progress that identified, among other things, the areas for country-specific action or efforts that could be undertaken jointly on financial sustainability, private sector stimulation and the business regulatory environment, transitioning to sustainable growth and resource mobilization. He said that the report would be refined and supplemented with a timetable for implementation. The refined document will be presented for consideration at the Heads of Government Meeting in July 2014. According to the Prime Minister, the thrust towards tackling the Region’s economic challenges included resource mobilization, considering best practices within the Community, and coordinating work in a more efficacious way. Other matters the Heads of Government discussed included the CARICOM-Canada Trade and Development Agreement with a view to concluding the negotiations by the end of June. “We spent a lot of time on this subject because this is important to the wellbeing of our people, our industries, for goods and services, and we are planning a number of initiatives in this regard to see how we could successfully conclude this pact in the interest of the people of the Region,” Prime Minister Gonsalves said. President of Guyana, His Excellency Donald Ramotar, Prime Minister of Barbados, the Hon. Freundel Stuart, and CARICOM Secretary-General, Ambassador Irwin LaRocque accompanied Prime Minister Gonsalves to the Press Conference.